New Zealander Philip Blackwood is going to spend two and a half years behind bars because he posted a photo of the Buddha wearing headphones. Last week, a Burmese court sentenced New Zealander Philip Blackwood to two and a half years in prison for a Facebook image. 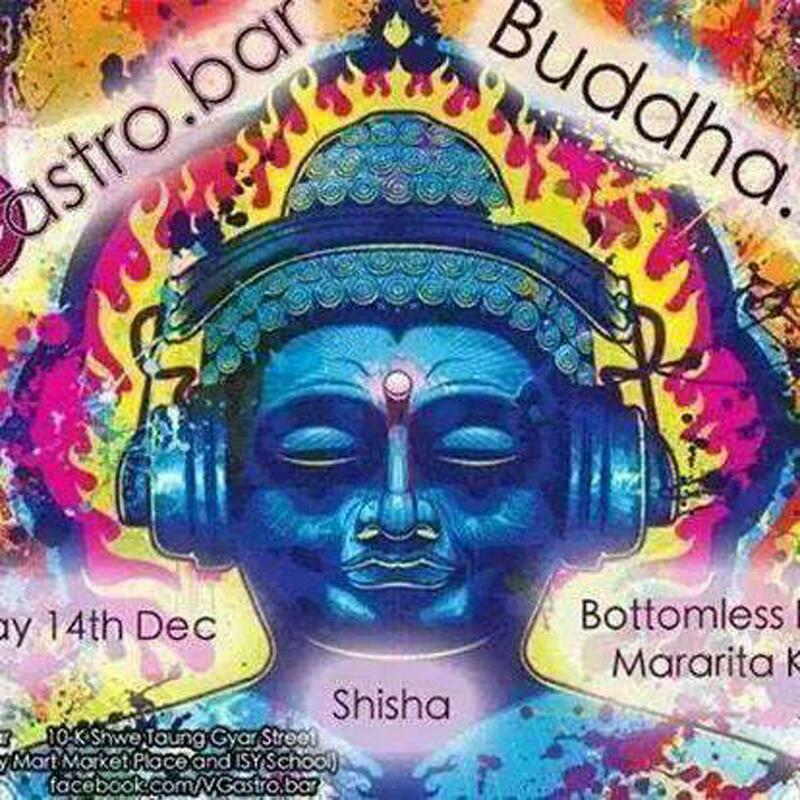 The picture was a depiction of Buddha wearing headphones that Blackwood used to advertise a bar he managed in Yangon called VGastro. Burma is 90 percent Buddhist, so it's certainly possible to see how that image might piss people off, but Blackwood's action was also apparently illegal. Under Section 295(a) of Burma's Penal Code, it is a criminal offense to undertake "Deliberate and malicious acts intended to outrage religious feelings of any class by insulting its religion or religious beliefs." Blackwood maintains that he never deliberately sought to offend Buddhism, and the incident has ignited an international discussion over the charge and the motives behind it. Robert San Aung, a Burma-based human rights lawyer, told VICE that groups of ultra-orthodox Buddhist monks, who have a history of violence, ensured Blackwood never faced a fair trial. "The monks are the ones who first reported the image, and then pressured the judge and the defense lawyers," he said. "They make people afraid to speak out, so Blackwood got the maximum punishment." Blackwood's family struggled to find legal representation because of the country's limits on free expression. His parents told VICE that lawyers were afraid to represent their son. "Each lawyer we appointed dropped out in a matter of days," said Brian, Blackwood's father. "They were threatened with violence and loss of credibility by police and hardline monks." Even U Mya Thway, the lawyer who finally agreed to represent Blackwood, mentioned his inability to speak out after the verdict. "I would dare to say [my opinion] if I was in another country," he told the Myanmar Times. "But if I make any comment on the court's decision I will end up in jail." What Thway is reluctant to say is that Blackwood's "intent" to offend Buddhism was never proved. Under Burmese law proof of intent is required, and this point is a source of frustration for his family back in New Zealand. "He made an ignorant mistake, and I know how he must have offended people," said Brian. "But he doesn't have an evil bone in his body. He's a typical Kiwi lad. How can they can they think he purposefully tried to offend anyone?" For what it's worth, after the image went viral and was clearly making people angry, it was quickly removed from VGastro's Facebook. That was followed by a lengthy apology acknowledging the restaurant's "embarrassing ignorance." While the verdict is likely confusing to Westerners, prominent Buddhists have also denouncing the verdict as harsh. Sitagu Sayadaw, one of Burma's most prominent Buddhist monks, called the action contradictory to the virtues of the religion. He said the "real insult" against Buddhism was the history of the government's treatment of its monks. "The Buddha image is not a big mistake," Sayadaw told VICE. "The real insult against Buddhism is the beating and killing of monks by the military regime in the past. Where are the charges against those policemen?" Some believe Blackwood's hefty sentence is politically motivated. Interfaith activist and founder of Coexist, Htuu Lou Rae, told VICE the verdict will make Buddhism appear as something in need of more protection. "In the lead-up to the coming election," he said, "this case will allow political parties to play the religion card to attract votes." Blackwood's case comes at a time when Burma's parliament is considering four new laws that would further restrict freedom of religion and discriminate against religious minorities. These include the Religious Conversion Bill, which would required any Burmese citizen wishing to change religions to apply through a government body, and the Buddhist Women's Special Marriage Bill, which would make it a crime for the non-Buddhist husbands of Buddhist women to attempt to convert their wives. These laws have been widely lambasted by human rights organizations including Human Rights Watch and Amnesty International. David Mathieson, Senior Researcher for the Asia Division of Human Rights Watch, said the Blackwood case demonstrates flaws in Burma's judicial system. "It's been used by people with a twisted agenda who see any slight as an attack," he said. "Now people are worried about how this case will affect the whole country, not just one bar manager." After their hearing last week, Blackwood, along with co-offenders Htut Ko Ko Lwin and Tun Thurein, were returned to their cells in Rangoon's notorious Insein Prison, where they have remained since their arrest last December. Blackwood isn't the first to fall afoul of Section 295(a). Last year, writer Htin Lin Oo was arrested for criticizing Buddhism at a public literary event, and Canadian Jason Polley was exiled for sporting a tattoo of Buddha on his leg.